From boardroom to bar, this wardrobe staple won't let you down. 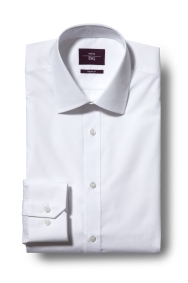 Simplicity and effortless style are what this regular fit white shirt from Moss Esq. is all about. Made from a polyester and cotton blend, the fabric is incredibly easy to care for, meaning you'll be dressed to kill in no time. Single cuffs and taped seams complete the package. Keep it chic by going open-collared under a Moss Esq. regular fit jacket. And for a splash of colour, turn to the Moss Esq. pure silk tie range. Such a good friendly service and they looked after me with my outsize suit. Fits well quality material. Delivery quick. The white shirt was perfect for the formal occasion in question - and the black shirt (not yet worn)was purchased for more informal occasions. I have no doubt it will be very smart and a useful addition. Always a pleasure going into the Chichester shop, the staff are knowledgeable pleasant and enjoy a little banter. Good value as was in an offer with extra trousers and x2 shirts. Good shirt, fits well, good price. Well fitted shirt looks very smart. Even with student discount it is pricey for a shirt that isnt double cuff and is 40-60% polyester. The actual staff service was great. You can improve by sending customers the correct product they selected, then reimbursing them for the cost of postage to return the incorrect item. It was also great to receive a free shirt as part of the deal. Although the shirt claimed to be non-iron, it needed a good iron and will need to be ironed after every wash. Good quality and looks smart. Offered an excellent suit at a very competative price, persuaded me to buy instead of rent. Rather cheaply produced shirt with inbuilt collar stiffeners rather than the expected insert sleeves. Suits seem fine, shirts good too. No issues nice shirt, good fit. Product quality is very good and great value. Designer clothes, at normal prices. It really looked good on me apart from the leave where the shirt was a bit loose. Shirt was lovely and comfortable. Good fit, well made, like. Very happy with my purchases. Best suit ive bought to date..?? Good value shirt, fits well. A plain white shirt for my daughter's wedding. Because of my neck, it was very difficult finding the right size & shape and to be honest, I'm still not 100% convinced we have the right shirt. But the member of staff was very patient and could not have done anymore to help. Got free with the suit, good fit too. Great product and price .. Excellent fit compared to most shirts. Perfect fit, lovely style and quality materials and packaging. Very good value. Great. Fits my son really well. Nice and comfortable. Nice fit, decent quality shirt for free! Value for Money. arrived very fast. Excellent quality. Definitely easy iron. Good fit and went great with suit. Great quality shirt - just what I required. Not a very good fit. And felt uncomfortable in the shirt all evening. Fits well. for a free shirt was ok. Excellent customer service, in store and online (ordering process clear and easy). All clothing has been of excellent quality and very good value. Nice shirt, fits well looks good. 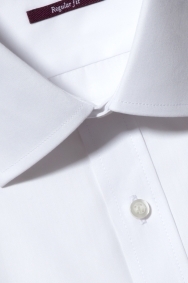 A good quality all round white shirt that came free as part of a deal with the suit. He knows just by looking at you what suit will look good on you. Lovely shirt but I had ordered the wrong fit, I should have ordered the slim fit. good shirts for everyday use. Simple but smart - like the design - have at least 10 now! The lady who served me couldn't have been more helpful or friendly, she was superb.